Could Unification of North and South Korea Happen by 2013? The Family Federation for World Peace and Unification (FFWPU) is an international society comprised of families striving to embody the ideal of true love and to establish a world of peace and unity among all peoples, races, and religions as envisioned by Rev. Sun Myung Moon. Many members of the FFWPU accept and follow Reverend Moon’s particular religious teaching, the Divine Principle, and are known as Unificationists. The FFWPU was founded in 1997 by Reverend and Mrs. 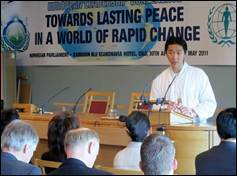 Moon in order to expand the mission of the Unification Church to create an alliance of people who generally share their vision of building God-centered families as the basis for healthy communities, stable societies and a peaceful world. The Family Federation for World Peace and Unification (FFWPU) is an international society comprised of families striving to embody the ideal of true love and to establish a world of peace and unity among all peoples, races, and religions as envisioned by Rev. Sun Myung Moon. Many members of the FFWPU accept and follow Reverend Moon’s particular religious teaching, the Divine Principle, and are known as Unificationists. The FFWPU was founded in 1997 by Reverend and Mrs. Moon in order to expand the mission of the Unification Church to create an alliance of people who generally share their vision of building God-centered families as the basis for healthy communities, stable societies and a peaceful world. FFWPU champions three ideals mentioned in its title: family, peace, and unification. Promoting the values that make for strong families is the central mission of the FFWPU. This means encouraging married couples to practice fidelity; it means parents loving and caring for their children, protecting them and educating them to uphold the highest moral standards; and it means children loving and respecting both their parents and grandparents. The FFWPU also seeks a “culture of peace” by supporting interreligious and international cooperation around the universal themes of family, love, and living for the sake of others. The word Unification in the title refers to the ideal of unity between mind and body, between husband and wife, and between heaven and earth.